With the hectic day-to-day schedules of most busy families, sometimes it is all too easy to forget to be Thankful for Togetherness. When making your list of must do’s before Thanksgiving, be sure to include projects that can be shared by old and young alike and, most importantly, together. D-E-C-O-R-A-T-E your front porch or entryway with pumpkins or fall flowers in pots. Whether you are on a budget or this is your favorite time of year to decorate so you usually go all out, HGTV.com and HouseBeautiful.com offer a cornucopia of options to choose from. G-I-V-I-N-G T-H-A-N-K-S is always more fun when shared together with friends and family. Create something that lasts not only for Thanksgiving Day but all through the season, such as a gratitude wreath filled with whatever you are thankful for. Using a basic wreath made of Styrofoam, grapevine or fabric, cut out different leaf colors, shapes and sizes to write a word or short message. Affix leaves to the wreath and your masterpiece is ready to hang. If you have more space or would like to create a centerpiece to use at Thanksgiving, create a tree of thanks. Simply arrange some twigs in a vase, attach your gratitude leaves, then add some ribbon or pine cones to complete the masterpiece. Y-A-R-D W-O-R-K can really be more play than work. Leaf blowers are not considered eco-friendly, so often the old-fashioned method of using a rake is best. Take care to choose the right rake that is the correct size to help prevent back strain. Leaf raking is a great workout, but remember gloves are helpful and closed-toe shoes are a must. Older kids can compete to see who rakes the biggest piles fastest. And the younger ones can help pick out the perfect leaves to use later for craft projects, or have fun making leaf angels (since there is usually no Florida snow). B-I-R-D-S will be thankful if you set up a few feeders or add a birdhouse to your yard, for them to enjoy throughout fall and winter. Ready-made feeders are inexpensive and bird house kits are readily available for kids of all ages. Looking for a family craft project on a chilly or rainy day instead? 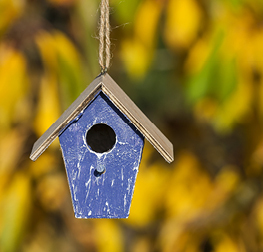 Consider crafting a kid-friendly bird feeder, a pro-DIY birdhouse, or anything in between. For more ways to welcome fall into your home and garden, check out ideas from Better Homes and Gardens and DIY Network.